It is time to listen and obey the voice, of Jesus the Messiah, as he says, “Come.” Climb out of the boat and leave your comfort zone. Focus your eyes on him, walking towards him and pay no attention to the wind or the waves. Let love and not fear motivate you. Jesus calls for you to walk in loving intimacy. Following his commands causes amazing things to happen. Do not look back or long for the comfort of the familiar. It is a new season. It is time to move towards Jesus and your destiny. Listen and quickly respond to his instructions. Amazing things happen because your focus is, on the Lord, not your circumstances nor yourself. Get moving and do not delay! Amen!! Thanks for the reminder. It is a new season!! Secret Angel, your obedience to the voice of Jesus brings miracles in your life that points many to Christ! You have no idea how much your words have touched me. I appreciate your prayers and encouraging words. You are a tremendous blessing to me as your words always come during a time of need in my life. Much love and ((hugs)) to you all at Pure Glory!! God is good, He is our shepherd and leads us to good pasture. Much love and a gigantic hug! Amen… Yes He is… and a big hug to you too! Oh, this is a wonderful message, Sister Hazel. Thank you. Whenever anyone asks me what my favorite quote is, I always tell them it is the one word quote from Jesus to Peter: “Come.” The Lord is always ready and eager for us to walk in the miraculous, if we will just believe Him enough to obey him and get out of the boat. I live my whole life dependent on that one word. Oh yes, Sister Sandra, the power of COME! It is profound. Nothing is impossible when we trust and obey and get out of the boat! What a great way to live your life! Unbeatable! Such a much needed reminder! Thank you! You’re most welcome! Blessings Tammy! Yes and Ames Sister Hazel! I receive this now, thank you! 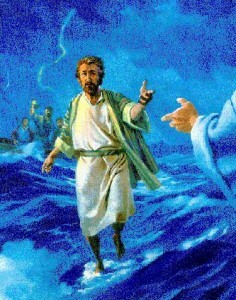 sister Diana, as you obey Jesus’ word, “come,” walk on water! Nothing is too difficult! Jesus is near!